The New York Hilton Midtown is now sold out. Please contact A Room With A View for information on the designated CAS overflow hotel and they will secure the lowest available rates within walking distance of the New York Hilton Midtown. In the event that rooms become available at the Hilton due to cancellations, A Room With A View will notify conference attendees and help transfer reservations back to the Hilton in the order in which they were booked. A Room With A View may be reached at 1-800-780-4343, and international attendees may contact them at ARWAV@charter.net. This is a FREE SERVICE for all CAS attendees. Since 1963, the New York Hilton Midtown has hosted everyone from presidents to celebrities to business people to families. During that time, it has built a reputation of not only being one of the most lavish hotels in New York City— but also one of the most welcoming. Every detail has been considered and every comfort is provided. Located in the midst of Manhattan action, in central Midtown, New York Hilton Midtown is a convenient location for both business and pleasure travelers. The hotel has recently undergone renovations and added modern conveniences, and features spacious guest rooms with modern décor, a full menu of guest services, and an 8,000 square foot fitness center. New York Hilton Midtown is much more than a place to stay in New York City. It’s a place to experience the city in ways that will inspire, delight and even surprise you. Room Rate: $399 for single/double room, plus taxes. Reservations must be made prior to 5:00 p.m. (local hotel time) on October 17, 2014. For telephone reservations, call 1-800-HILTONS (1-800-445-8667) and reference the code: CAS or refer to the “CAS 100th Anniversary Meeting 2014”. While reservations must be made prior to October 17, 2014, in order to receive the $399 rate, there is no guarantee that rooms will be available should you wait until this date, especially since this is the Centennial Celebration. CAS strongly suggests that you make your room reservations early to secure accommodations before the room block fills. 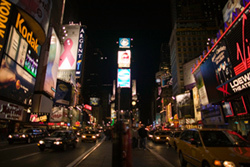 The hotel website includes directions and distance from each of the airports in the New York area. Please visit the hotel’s Maps & Directions page for further information. For more information on the hotel or the Manhattan area, please visit either http://newyorkhiltonhotel.com/ or http://www.nycgo.com/, respectively.